GPS receiver with auto-routing, large gray scale display, integrated world and Europe/Africa map plus serial interface. Well suited as a hand held device or to be used in all kinds of vehicles. 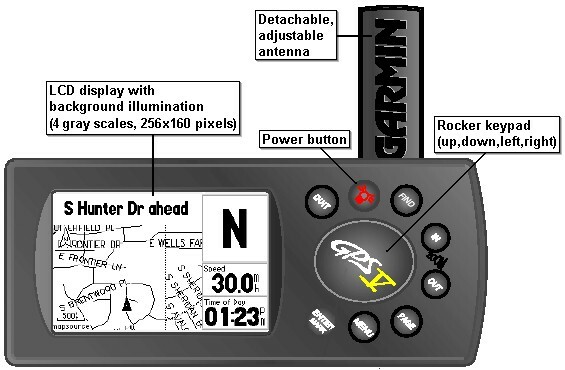 The GARMIN GPS V provides automatic route calculating, visual guidance, is easy to use, provides a multi-lingual user interface, has a large, easy to read gray scale display, an extremely sensitive antenna, an integrated world map (overview) plus a base map of Europe, Africa and the near East. There is 19 MB of built-in memory to store even more detailed information, such as local roads, restaurants and points of interest. 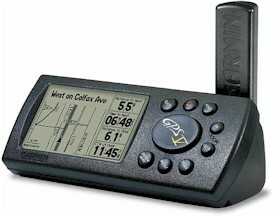 The GPS V provides navigation information outdoors, in a car, in a train or even in an airplane (see MapSource examples). The built-in serial interface supports data exchange with a PC. 19 MB of built-in memory to download additional, even more detailed maps with roads, crossings and addresses of restaurants, public buildings, points of interest etc. from a PC. Suited as a hand held device or to be used in any kind of vehicles. Comes with power cable and dash mount kit with adhesive folie with shutter for quick mounting and dismounting to easily remove the GPS receiver (seamless switching between cars, theft protection etc. ), does not require any installation. Automatic computing of a route to a user selected destination. FIND: Search for waypoint, city or exit. If there are one or more maps stored in the optional memory module, additional search functions for points of interest, addresses and intersections are available. * The number and the content of the data fields are user configurable. You can select from 33 different values. * The content of the data fields are user configurable. You can select from 33 different values. 3 Course to Steer (CTS) The heading you need to maintain in order to reach a destination. 4 Cross-Track Error (XTK) The distance you are off the desired course in either direction. 5 Distance to Final Current distance to the final destination. 6 Distance to Next Current distance to the next waypoint (turn, crossing etc.). 7 ETA (Estimated Time of Arrival) to Final Estimated arrival time at the final destination. 8 ETA (Estimated Time of Arrival) to Next Estimated arrival time at the next waypoint (turn, crossing etc.). 10 Final Destination Name of the final destination. 11 GPS Accuracy Estimated accuracy of the current position information. 12 Heading The direction in which you are moving. 13 Maximum Speed Maximum speed since last reset1). 14 Moving Avg. Speed Average speed without the time with no motion since the last reset1). 15 Next Destination Name of the next waypoint (turn, crossing etc.). 16 Odometer Total travelled distance since last reset1). 18 Overall Avg. Speed Average speed including the time with no motion since the last reset1). 19 Pointer Pointer showing the direction to head to. 24 Time to Final Estimated travel time to the final destination. 26 To Course Direction to the planned course. 27 Trip Odometer Travelled distance since last reset1). 28 Trip Time - Moving Time with motion since last reset1). 29 Trip Time - Stopped Time without motion since last reset1). 30 Trip Time - Total Total time since last reset1). 31 Turn The degrees which must be added to or subtracted from the current heading to reach the course to the intended waypoint. 32 User Timer Incremental or decremental timer (stopwatch or countdown). You may reset the trip-counters, the Odometer and the Maximum Speed independently of each other. This model has been discontinued; however, you can still order options for the GPS V.
All options for the GARMIN GPS V in detail, find maps here.